Ms. Preeti Mehta announcing the commencement of the inaugural session. Mr. Vikas Sharma delivering the inaugural address. Mr. P. Balaji addressing the august gathering. Mr. Narender Bhola delivering his address. Key note speaker, Dr. Sahoo delivering his speech. Mr. Anurag Batra delivering his address. Morning High Tea presented an excellent networking opportunity. Interesting points were raised and clarifications sought from Dr. Sahoo. Dr. Sahoo patiently and comprehensively answered every query. An elaborate lunch was served to the delegates. Provided a perfect networking opportunity. An interesting topic had whetted the appetite of the delegates. Mr. Manoj K. Mishra making his speech on the challenges and way forward for the code. Dr. Vijay K. Singh had many interesting points to share with the audience. Mr. J. K. Budhiraja made some very relevant observations. Mr. Nesar Ahmad provided a lot of clarity on the code through his speech and presentation. Session 3 QnA session saw active participation from the audience. All questions we addressed and answered by the speakers. Ms. Alka Kapoor making her speech in the valedictory session. Mr. Amarjit Singh Chandhiok’s raised some interesting points during his inspirational and positive valedictory speech. Dr. Mukulita Vijaywargiya making her valedictory address. Ms. Sushmita Dev delivering her valedictory address. Mr. Vikas Sharma making the vote of thanks. With the end of the valedictory session, the conference came to its conclusion. 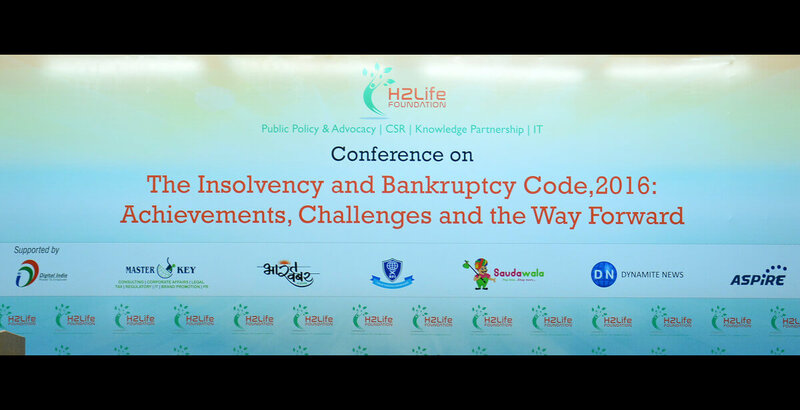 April 15, 2017: H2 Life Foundation organized a one day conference on “The Insolvency and Bankruptcy Code 2016: Achievements, Challenges and the Way Forward” at Indian Habitat Centre, New Delhi. “We had freedom of entry, and freedom to compete and now we have freedom to exit”. Mr. P. Balaji, Director, Regulatory, Vodafone India. The Second Session was an interactive session with Mr. Sahoo in which many delegates from various fields asked a variety of question on Insolvency and Bankruptcy code 2016. The main highlight of this session was how IBBI is looking at the possibility of fast-tracking resolution process for smaller cases and those having less complications. Presently, The Code provides for completing insolvency resolution process within 180 days and the time-frame starts from the insolvency commencement date. Now, the idea of bringing it down to 90 days for smaller cases is being looked into. The Third session which concentrated on “Ease of Doing Business in India: Provisions for ‘startups’ and ‘cross border insolvency’,” was moderated by, Mr. Anurag Batra, Chairman & Editor in Chief, Business World. The other distinguished speakers of this session were Mr. Vivek Kumar, Director & Co-Founder, goSporto, Mr Dilip K Niranjan, Advocate and Mr. Vijender Sharma, Cost Accountant. During this session, they widely discussed and debated how the code will be helpful for new ventures and startups, how the code will ease the problem of cross border insolvency and how it will encourage foreign investments. They also discussed, how entrepreneurs will be able to make a fresh beginning after exiting from failed ventures. The panelists in the Fourth Session which was related to the “Challenges in the Existing Framework and the Way Forward”, included, Mr. Manoj K Misra, Head of Regulatory, Vodafone; Dr. Vijay Kumar Singh, Associate Professor & Head - School of Corporate Law, Indian Institute of Corporate Affairs; CMA Mr J.K. Budhiraja, CEO Insolvency Professional Agency and Senior Director (Technical), Institute of Cost Accountants of India, and Mr. Nesar Ahmad, Former President, Company Secretaries Institute. In this session it was discussed that, firstly the policy was creditor driven; secondly the institutional setup is still not sufficient, and thirdly bankers and management professionals were not considered for the Insolvency Professional examination. In the last and concluding Valedictory Session the delegates were addressed by Dr (Ms) Mukulita Vijaywargiya, Member, IBBI. She congratulated H2 Life Foundation for organising the conference on the new Code and also talked about how she intends to work on the recommendations made during the course of the day. Mr. Amarjit Singh Chandhiok, Senior Advocate, & Member IBBI Advisory Committee on Service Providers requested the participants to maintain a positive attitude towards the code, and work together towards its effective implementation. CS Ms. Alka Kapoor, CEO, Institute of Company Secretaries of India applauded the Government’s aim of raising the bar to 90th position by 2018 and to 30th position by 2020 as far as ease of doing business with India was concerned. She also praised the Government’s commitment to releases substantial capital locked in NPA (Non-Performing Assets), thereby helping the economy prosper. Ms. Sushmita Dev, Member of Parliament was thankful to H2 Life Foundation for taking up the Insolvency & Bankruptcy Code for discussion. She asked for White Paper recommendation from the proceedings which she said she will take to the Parliament. The conference witnessed massive participation of delegates from varying fields which included Members of Parliament, economists, representatives from Financial Institutions, lawyers, chartered accountants, cost accountants, company secretaries, corporates, diplomats, think-tanks, and media personnel.